Look - I love food. And that means there's a good chance I'll be scoping out the Food Network and the Travel Channel. And guess who's on the Food Network 50% of the time. Guy Fieri. The GF's not a fan at all, but I can't complain about some of the food that's shown on his show. Heck - I can't complain about Guy Fieri's food either, because I've never tried any of his restaurants (though there's plenty of folks that have gone off on that!). That being said, there's one place in Chicago he highighted that really caught my eye. More importantly, it's been consistently ranked as a Chicago favorite. I mean c'mon - pork belly po' boys and foie gras fries? That's right - I'm talking about Big & Little's. I stopped by the New Orleans location, which hides a gem within a somewhat sketched out area. Once inside though, there's plenty of seating in the form of patio picnic tables. 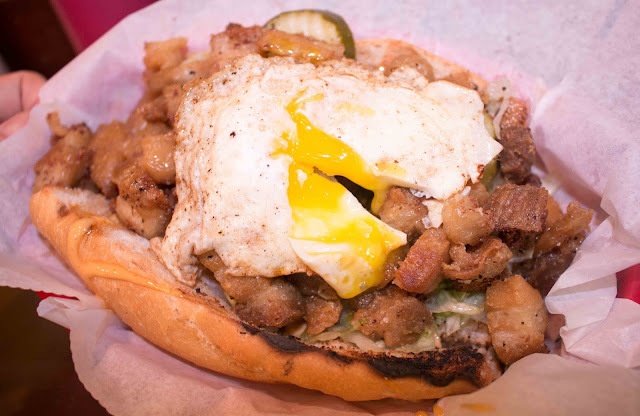 I ordered my pork belly po' boy with a fried egg on top - cuz that's how I do. The over-easy fried egg didn't have a ton of yolk, but I'm all about adding up the cholesterol intake regardless. There was plenty of crisply fried and well-seasoned bits of pork belly to help that along. The crisp pickles helped to provide a small amount of acidic balance, but the drizzle of maple syrup aioli brought this bad boy over the top. The bread was nicely crusty, but eventually it became drenched in grease and maple syrup drizzle. Overall though, a solid bite, if you can get your mouth around it! I was blown away by the foie gras fries though. A must order! A generous lobe or two of foie was on offer, with a nice caramelized sweetness that was surprising. 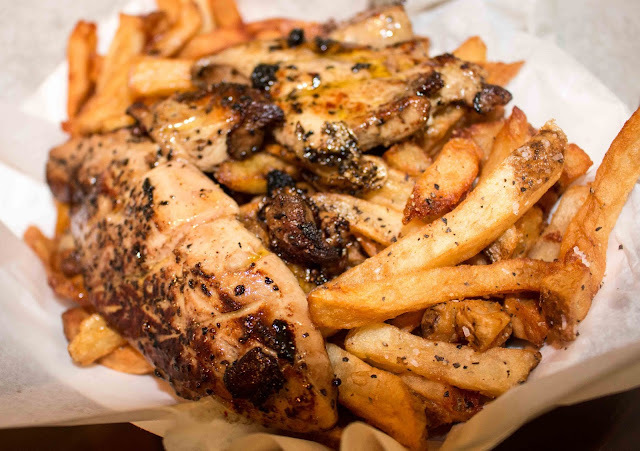 The fatty foie drenched the crisp fries underneath, which were fried up in soybean oil. The spuds were seasoned well, with the pepper really coming through on each bite. Ridiculously good. 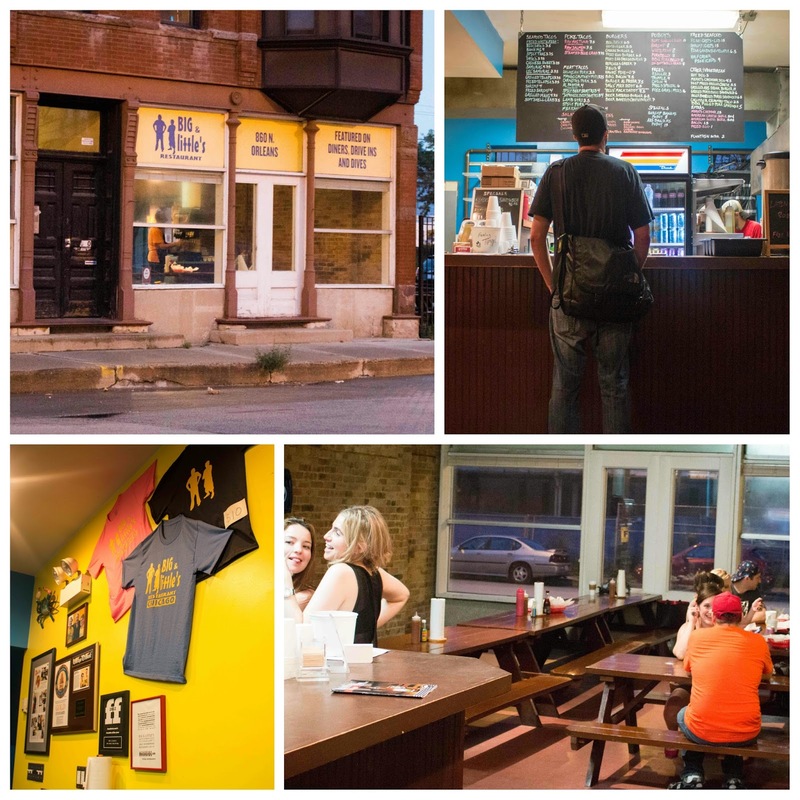 I had a chance to talk to co-owner Gary Strauss (the Big in Big & Little's) and it's clear he has a lot of appreciation for the accompanying explosion of business that came with Guy Fieri. Gary and Tony D'Alessandro (Little) were smart though and took their time before opening their second store. Still, business kept booming because they soon opened up a third location. In my estimation, that sort of exponential explosion can't be due to Guy Fieri alone. Consistency and quality are key and exemplified in the fact that they still work at all the stores and shop for their produce daily. They constantly rework the menu, but the classics remain. Because there's no reason the foie gras fries should ever '86ed!